Our Ceramic guides for Delta are used in various applications within the saw mill industry and have been many years. You'll get cooler and quieter bandsaw operation with any of our Ceramic guideblocks and thrust bearings offered. 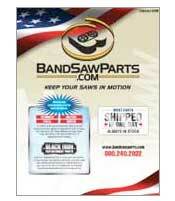 By making your bandsaw blades run cooler, they will last longer. Blocks reduce friction, heat build-up and prevent wear and tear on your blades. They will also increase the accuracy and cutting performance of the blade while eliminating twisting and damage to the teeth. Delta 14" - Set includes three blocks measuring 1/2 x 1/2 x 3/4 & one block measuring 1/2 x 3/8 x 1. Set includes four blocks, each measuring 5/16 x 5/16 x 3/4. Set includes three guide blocks measuring 5/8 x 5/8 x 1 and one parallelogram measuring 5/8 x 5/8 x 2.